The Oppo F7, just like the R15 and R15 Pro, packs a notched 6.23" screen of 2,280 x 1,080 pixels (that's 405 ppi). This is yet another unusual screen aspect ratio, this time of 19:9, and let's hope it won't break many apps. The screen has a piece of Gorilla Glass 5 to guard against scratches. The F7 also comes with a factory-applied screen protector out of the box. In our display test, the F7 managed about 450 nits of maximum brightness - not the best we've seen - but bright enough for a decent job. Then the black levels we measured are one of the darkest we've seen on an LCD screen. Thanks to those deep blacks, the F7 scored one of the highest contrast ratios we've calculated for such type of display - 2000:1. Impressive job, indeed! 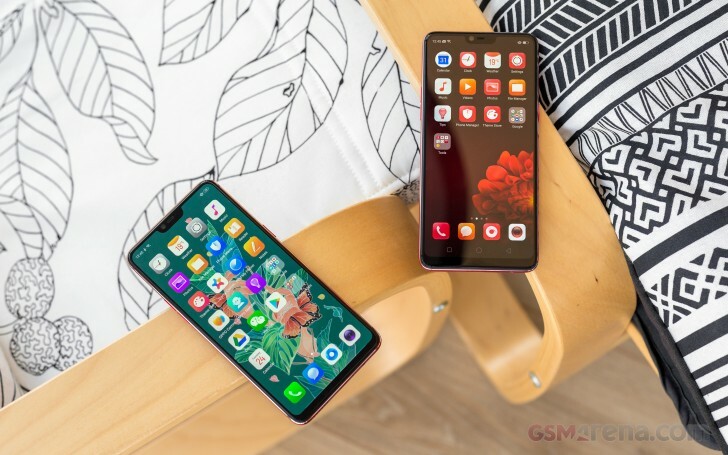 In our sunlight test, the Oppo F7 demonstrated above average contrast for a phone with an LCD panel, and scores on par with the Honor 9, Oppo R7 and R9s. You should be fine with the F7 in the bright sunny days, but only when using the maximum brightness. We also measured the color accuracy of the F7 display. The average DeltaE is 5.8 with the maximum deviation of 9.6 being at point white. There is a noticeable blue tint on some of the colors, including white, but you can use the Warm Color temperature option from Settings to lower the blue impact. The Oppo F7 is powered by a 3,400mAh battery (Li-Po) sealed inside its body. The F7 lacks support for the fast 20W VOOC charging standard - the best it can do is 10W. In our tests, it reached a 28% charge (from flat) in half an hour, and a full charge - in about two and a half hours. ColorOS features a few power saving modes that are enabled by default, so you may notice how the phone often intervenes by killing background apps for you - perhaps way too often. If that causes issues, you can exempt specific apps from this behavior. We found it too aggressive to our taste and had to go and white-list a few apps manually (a minor note: we wish we had a way to do this from the app switcher, instead of having to go into the settings). The Oppo F7 posted an overall great battery score of 91 hours in our standardized test - exactly the same as the Oppo F5. The video playback and call endurance is the same, while the web test returned lower score probably due to the new screen. The Helio P60 chipset (and modem) turned out more efficient in standby consumption than the Helio P20 in the Oppo F5 and the Snapdragon 660 in the Oppo R15 Pro. Our endurance rating denotes how long a single battery charge will last you if you use the Oppo F7 for an hour each of telephony, web browsing, and video playback daily. We've established this usage pattern so our battery results are comparable across devices in the most common day-to-day tasks. The battery testing procedure is described in detail in case you're interested in the nitty-gritties. You can also check out our complete battery test table, where you can see how all of the smartphones we've tested will compare under your own typical use. The Oppo F7 has a single bottom-firing loudspeaker and scored a Very Good mark with its single loudspeaker, an improvement over the F5. It's a bit quiet in the vocal range, but it performs great for music and the sound output is rich and clean most of the time. Oppo F7 did flawlessly when hooked to an active external amplifier - it delivered very loud output that was perfectly accurate too. There’s really little else we could want here. Plugging in a pair of headphones delivered a blow to volume levels, which sunk to average levels. Some intermodulation distortion and a moderate amount of stereo crosstalk crept in too, so the performance is not quite as impressive here. Still, it’s a solid job for a mid-range and one most people will be perfectly happy with.